The coming of spring usually sees homeowners using their heaters less and less often until they finally turn them off until next fall. Now is the ideal time to schedule repairs on any problems you may have. Doing so can save you effort when the weather starts to cool again at the end of summer, as well as ensuring that your furnace is ready to go on the first day you need it. It can be easy to keep the system running in the face of an obvious problem, but with winter now behind us, any lingering issues with your furnace should probably be dealt with. Beat the Heat with a Spring AC Tune-Up! Spring is on the way and that means summer won’t be too far behind. 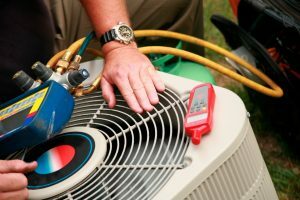 When it comes to your air conditioner, you’re going to need to keep it in good condition, and ensure that it will respond in the middle of our patented heat waves. That starts now with a spring AC tune-up. And with the deal we have going now, there’s never been a better time to schedule a tune-up today. Posted in Air Conditioning | Comments Off on Beat the Heat with a Spring AC Tune-Up!